For the past few days, I have been bumping all around the Internet on the picture above. Originally posted in Itchy Feet, a travel and language webcomic by the illustrator Malachi Ray Rempen. 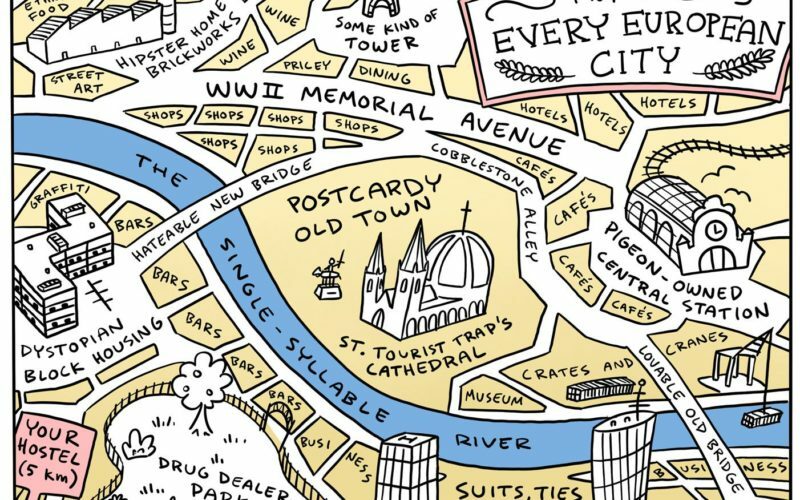 It depicts a map of Every European City, implying that there is no real difference between the cities in this continent. It’s quite obvious that Malachi is being sarcastic. He is an avid traveller, and as such, I’m sure he would never generalise in such a way. Yet, the reality is that the thought that everything is always the same is not something that escapes most people nowadays. When travelling was not accessible for most of us, every single time we left our home it felt special. But the low-cost travel companies, the globalization, the Internet. Everything has put us in a place where we start counting the countries we have been in by the numbers. It’s not even worth enunciating anymore. Like, “I have been to 27 countries, but I could not possibly remember them all”. Every church is just another church. Every old town is just another old town. Arts and crafts, museums, restaurants. Yeah, it’s nice, but it’s not really special, it’s not new, it’s not different, not different enough. But is that really the case, or we don’t know how to look at things anymore? I have been trying to solve this problem by staying long-term wherever I go if I have the chance. I stopped counting countries and decided to accept that I won’t see it “all”. But this is not an easy cure for most. People usually have time limitations, so is there another way of not seeing things as a repetition of the same feelings experienced before or is it actually just the way it is? I want to believe we haven’t gotten to the point where it doesn’t matter anymore whether you are in Germany, Latvia or Hungary. commentLeave a Comment on Is it all just the same or we don’t know how to look anymore?